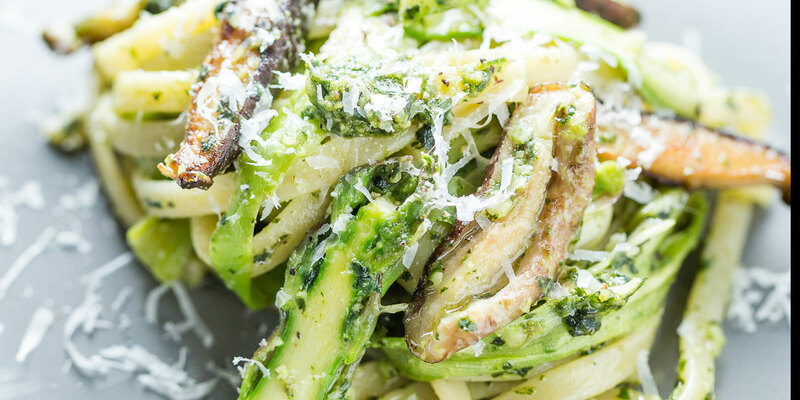 So who doesn’t love a super flavorful and bright pesto pasta? 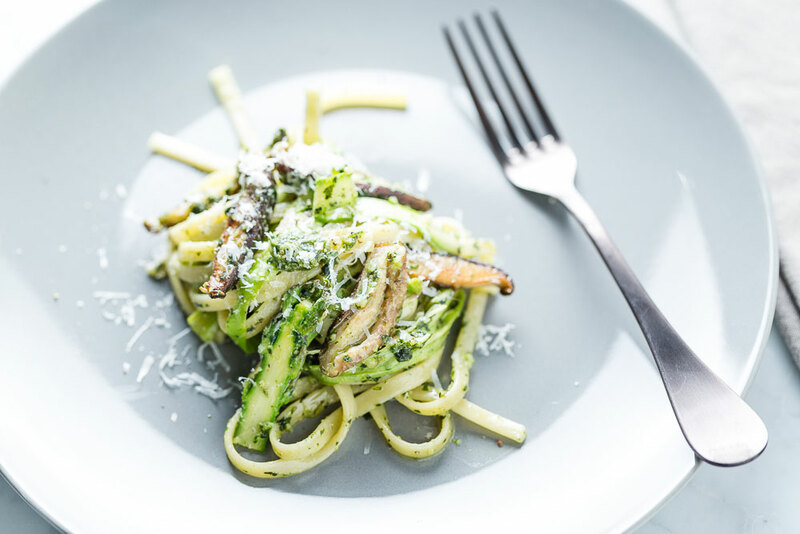 I have to admit that when I started thinking of this dish, I fully intended to have the asparagus ribbons replace the noodles. Actually, I was even thinking of making the pesto out of asparagus instead of basil. Well, my love for fettuccini noodles is too strong so they all made it into the dish. The shiitake mushrooms add a nice meaty texture that goes great with the asparagus ribbons. If you have never made pesto, you should definitely give it a shot as it takes just a few minutes to blend up. 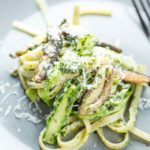 Pesto is more of a concept that is much broader than the traditional pesto with basil, pine nuts, garlic, parmesan and olive oil (which is what is in this recipe). You can use almost any ingredients on hand to make pesto. You can use any kind of nuts or greens. Parsley pestos are delicious, along with pesto made from carrot tops with walnuts. So many possibilities that can be paired with your dish. 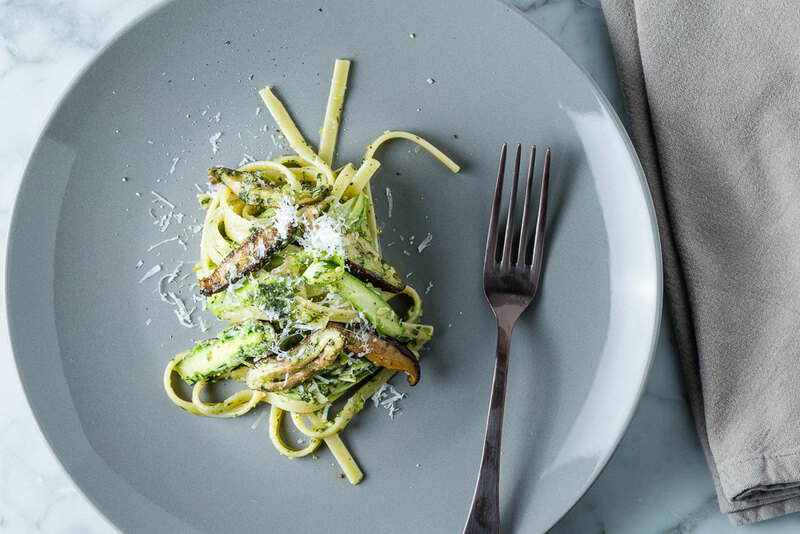 The pesto in this pasta dish is more of a traditional one, but feel free to mix it up. Combine all pesto ingredients except the basil in a food processor or blender. Pulse until the garlic and pine nuts are smooth. Add the basil and continue to pulse until a desired pesto consistency is reached. Don't over blend. Meanwhile, heat 1 tablespoon olive oil over medium-high heat. Add the mushrooms and sauté until they start to brown, about 5 to 7 minutes. Reduce heat to medium and add the sliced leek, plus a pinch of salt and more olive oil if the pan is dry. Continue to stir and sauté until the leek is soft, about 2 to 3 more minutes. 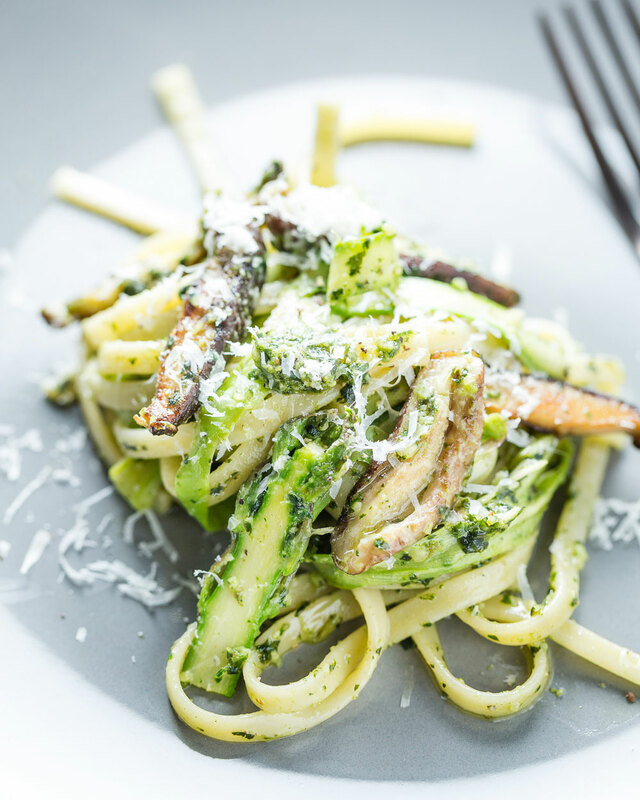 Make the asparagus ribbons while the mushrooms and leeks cook. Hold the cut end of the asparagus with one hand and run a vegetable peeler down the asparagus with the other on the counter, a rolling pin or over an upside down bowl. Flip the spear over once you reach the halfway point. Add the asparagus ribbons, the pesto and the cooked noodles to the pan with the mushrooms and leeks to just warm through, then remove from heat. Serve with grated parmesan cheese and a drizzle of extra virgin olive oil if desired.